rec. June 2016, Orchestra Hall, Minneapolis. DSD. 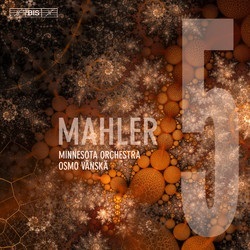 I hadn’t associated Osmo Vänskä or, indeed, the BIS label with the Mahler symphonies. I’d forgotten – if I ever knew – that Vänskä recorded the Schoenberg/Riehn chamber version of Das Lied von der Erde for BIS several years ago, with Monica Groop, Jorma Silvasti and the Lahti Chamber Ensemble (BIS-CD-681 [60:31]). My omission is all the more culpable because that recording was well received. It, too, can be downloaded from eclassical.com, in mp3 or 16-bit lossless, with pdf booklet. That this new recording of Mahler’s Fifth Symphony is advertised as the start of a cycle I find something of a mixed blessing, though I shall be looking out for the forthcoming releases of the Second and Sixth Symphonies. I can’t help wondering if the ups and downs of Vänskä’s time with his Minnesota orchestra are at least part of the reason why I still marginally prefer his earlier Lahti recordings of the Sibelius symphonies. In Mahler, too, the combination never quite seems quite as intuitive and satisfying as those earlier BIS recordings. That said, there’s much to enjoy and admire on the new recording, not least the strong dynamic contrast within and between movements, assisted by the wide-ranging BIS recording, of which more anon. Overall, however, I’m left almost as disappointed with this Mahler Fifth as Dan Morgan was with Otmar Suitner on Berlin Classics – review – but for a different reason. Where Suitner is enthusiastic and variably recorded Vänskä is often tentative but very well recorded. Of the many benchmarks which I could have chosen for the Fifth Symphony none has been as enduring as Leonard Bernstein’s DG recording with the Vienna Philharmonic. Rather confusingly it’s available at both full- and mid-price: the latter is on DG Grand Prix 4776334. The 11-CD set of all the Mahler symphonies from this cycle remains available at budget price on 4778668 – Bargain of the Month review. It’s on offer as I write from Presto for under £30, though vinyl enthusiasts will find themselves having to pay much more for the 15-LP set, at around £180 plus extra postage. Bernstein’s view of the symphony developed considerably between his NYPO recording for CBS – still available singly or on Sony Tandem with No.1 and the Adagietto of No.10, both at budget-price1 – and that VPO remake. In particular he gave a great deal more heft to the opening Trauermusik: it’s not just that he broadened it out from 12:28 to 14:32, he seared the movement into the consciousness of the listener. Well played as the new Vänskä recording is, it doesn’t come close to matching Bernstein. The opening trumpet call is not meant to be exuberant but whereas with Bernstein it’s tentative but indicative of what is to come, with Vänskä it’s hesitant and almost wavery. The tempo is broader than Bernstein’s with the NYPO but, at 13:09, it’s still significantly faster than the VPO version and the power of the movement is consequently diminished. In the second movement the comparison works the other way around, with Vänskä almost a minute slower than Bernstein/VPO; though here there is less to choose between the two, the stormy quality of the movement (marked initially stürmisch bewegt) is more emphatic on DG, though Bernstein had toned down his response to this movement since making the NYPO version. Mahler marks the Scherzo third movement nicht zu schnell (not too fast) and Bernstein takes a fairly sedate 19:02 against Vänskä’s 17:58. Here the faster tempo works very well. The casus belli among interpreters of this symphony concerns the fourth movement, marked Adagietto. Sehr langsam. How slow should sehr langsam be? There is some evidence that the chosen tempo for this movement slowed over the years, though several recent recordings have sought to restore the balance – one gifted amateur conductor even spent a good deal of his own money making a recording to prove that a faster than usual tempo could work well. On Sir Georg Solti’s influential recording the movement is taken surprisingly fast, at 9:50 – memory had suggested otherwise. (Double Decca 4583832, with No.4, download only2 or 10-CD set of the Mahler symphonies). Simon Rattle even makes a good case for a faster tempo still at 9:32 (EMI Masters 0851922, around £8 – don’t dream of downloading for as much as £13.99). His version is much admired in many quarters, but not by Tony Duggan – review of original release. Bernstein is slower than that, at 11:13 with the VPO, a tad slower than his NYPO recording, but he never allows the music to drag. As so often, tempo is less important than keeping the music moving and he certainly does that, while plucking at the heart strings just the right side of good taste. Jonathan Nott (Tudor) on a very well recorded SACD might seem to strike a happy balance between tempo extremes at 10:59 but, much as I liked this account, it doesn’t have quite the impact of Bernstein. Nor does an otherwise attractive performance from Iván Fischer with the Budapest Festival Orchestra at a similar tempo on Channel Classics CCSSA34213 – review – DL News 2013/15. Vänskä’s 12:40 is just too slow and verging on the lethargic and the Rondo-finale doesn’t entirely compensate, though the end of the movement certainly brings a powerful resolution. I’ve already mentioned the wide dynamic range of the recording, very apparent in the 24-bit download – the stereo: I haven’t heard the surround version. It’s even apparent from the mp3 version as played on the all-in-one players in the bedroom and kitchen. Like some of my colleagues I have occasionally had cause to comment on over-wide dynamic range from BIS and other labels. Certainly the Bernstein on DG, 1988 DDD and still sounding very well, is easier to live with in that regard, but the Vänskä recording narrowly avoids the problem of having to turn up the quieter passages only to be blasted by the climaxes. Surprisingly, eclassical didn’t offer the booklet with the download at the time of writing, so I had to glean the recording details and read the notes elsewhere. This, then, is not my ideal Mahler 5 – for that I still turn to Leonard Bernstein on DG, on offer as I write for around half the price of the new release – but those who find Lenny too hyper-emotional may wish to give Vänskä a try from one of the streaming services. 1 Downloaders will find the NYPO version for as little as £2.65. 2 Two Solti Mahler symphony recordings have recently reappeared from Eloquence, perhaps to be joined by No.5?